Do you have a mini trampoline or even a large on in your yard? Perhaps you should as there is a growing epidemic with American children. One that shows little sign of slowing: obesity. This is brought on by days spent glued to the latest program on television or trying to conquer an extremely difficult level on a computer game. Kids are spending more time indoors, and less moving about. So, what do you do? How do you pull your child’s attention from fast-paced entertainment? While some may deem this too old-fashioned for today’s youth, studies have shown that children are more likely to spend their hours on a trampoline that the more commonly thought of sports of biking or swimming. This is mostly due to the fact that the trampoline is so simple: you go to the backyard, get on and go. There are no complicated rules to follow (don’t skate here, you must be this tall to be in the end of the pool, stay off the trail, etc.). A trampoline is simple–you just start moving. And even one hour a day of that moving can decrease health problems, and start your child toward a better life. Obesity causes multiple health problems: diabetes, increased blood pressure, heart disease, etc. These can occur in children and, if the problem isn’t taken care, they will almost certainly occur in adults. What your child is learning today will affect him or her for tomorrow. So why not teach something valuable? Exercising instead of sprawling out on the couch is the right way to live. Yes, you should allow our children t watch television; yes, they should be allowed to chat online with their friends. But they should also be made to move. Give them exercise with a trampoline. This is a simple, but effective, way to help reduce the risks of obesity and start your child toward a healthier life. And isn’t that what you want? Why take the chance that he or she will grow up to have the complications and problems that come with being overweight? Why risk that when you have the chance to curb it now? Simple exercise greatly reduces the chances for health concerns, and what could be simpler than a trampoline? The truth is: it’s very easy to let your child sit around the house, playing their video games or watching television. But, with that, it’s also easy to let them become overweight and suffer in the future. Instead, get them outside and get them active. Neither of you will regret–a trampoline will let you both exercise and enjoy it. Give your children (and yourself) the chance for a healthy future. Buy a trampoline and start them toward a path of regular exercise. You will both see the advantages–you because you’ve managed to get them away from the television; them because they’ve discovered something fun to do. It’s the simple way to do what’s right. 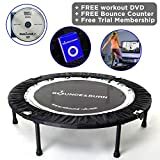 A trampoline will let you both discover how fun exercise can be, and how the television or computer isn’t needed to have a good time. It’s easy, fun and effective. What could be better? You can watch the video below on YouTube! Check out the min-trampolines on Amazon!